On Friday evening I watched Mike Daisey perform The Agony and the Ecstasy of Steve Jobs at Berkeley Repertory Theatre. Macworld was in full-swing across the bay, and the pumped-up music playing as the house opened aimed to rile the audience as if for a convention keynote. In the event, the one-man performance at Berkeley Rep was a bit strange ... Daisey sat and spoke for nearly two hours, without intermission. Daisey's way with voice and gesture animates what amounts to a travelogue interleaved with historical accounts of technology fetishism, his and ours. Still, the show boiled down to political argument. It argued to lift a curtain from realities that are usually hidden from we First World folk -- that the human cost of wealth and privilege is imposed on the bodies and lives of people who work the factories and farms that produce "our" stuff. That the argument is powerful and tragic didn't qualify the evening as what I usually think of as theater. Nonetheless, Daisey conjured up some pointed insights. I witness that sort of underlooking every time I nearly run into a pedestrian (on foot, on my bike, with my car) who is crossing a street while talking or texting. Crossing a street while talking or texting is not smart, I don't care what they call the devices. There is, of course, a vivid world beyond ethernet ... which I trust anyone can realize if s/he pulls away from a monitor, Crackberry, or iThing long enough to think about it. This is not news. Among many others, Jerry Mander (whose work I've mentioned before) has been going on in this vein since he published Four Arguments for the Elimination of Television in the late 1970s. But Daisey's observation made me think, as I had often this month while reading Amitav Ghosh's novel The Hungry Tide, about how books can be compelling even if what they do best is put one in an unfamiliar and intriguing world -- beyond the borders of one's own. 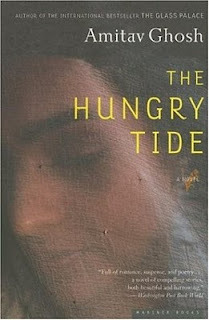 The Hungry Tide was like that for me. I didn't like how the novel opened. The initial drama seemed thin and artificial. The author's excuses to depart on long (if fascinating) flights of exposition were similarly thin, and recurred frequently enough to feel intrusive. On the other hand, description of the tidal forests of the Sundarbans, and the people & plants & creatures who inhabit them kept me riveted. I have never been to south Asia; the only other 'experience' I have of the Sundarbans was acquired via Salman Rushdie's Midnight's Children (which I also found awkward as a novel: too self-consciously mythic, never mind the bombast). Even when we detect cracks in the craft, books and intertube ephemera can compel simply by taking us past the worlds we know. This is true even when we understand that neither reading nor web surfing is the same as being in another world oneself. Yet it's a testament to the power of imagination that a person living on the west coast of Turtle Island (in Gary Snyder's sense of the place-name) can have some sense of the Sundarbans' mangove swamps, tigers, and crocodiles through book-assisted visits. Is there truth in that sort of sense? I can't say for the Bay of Bengal, but if I extrapolate from odd recognition I've felt visiting parts of Europe and North America that I had only known through books and paintings and films -- maybe so. "That tiger had killed two people, Piya," Kanai said. "And that was just in one village. It happens every week that people are killed by tigers. How about the horror of that? If there were killings on that scale anywhere else on earth it would be called genocide, and yet here it goes almost unremarked: these killings are never reported, never written about in the papers. And the reason is just that these people are too poor to matter. We all know it, but we choose not to see it. Isn't that a horror too -- that we can feel the suffering of an animal but not of human beings? [...] [W]e're complicit in this [...] Because it was people like you," said Kanai, " who made a push to protect the wildlife here, without regard for human costs. 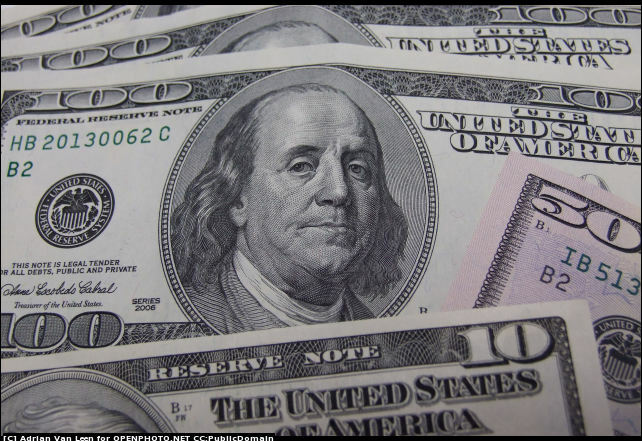 And I'm complicit because people like me -- Indians of my class, that is -- have chosen to hide these costs, basically in order to curry favor with their Western patrons. It's not hard to ignore the people who're dying -- after all, they are the poorest of the poor." Piya has an answer ready for Kanai, and it holds up to the truth of the horror he has told. When I came to the passage just quoted the day after hearing Mike Daisey tell about working conditions at Foxconn Technology Group in Shenzen, China, where electronic components are made for Apple, Dell, Nokia, Sony, and other widely-consumed brands -- conditions that drive migrant workers to suicide -- it was hard to miss the comparison. "I’m really proud that we had the opportunity to take The Agony and the Ecstasy of Steve Jobs to India this summer. I got to perform early versions of this show talking about China’s labor policies in the context of performing in India with Indian audiences who are having the same multinational corporations move in and try to enforce the same labor standards. It was riveting to get to have these conversations late into the night with people and feel how this is a living story that really matters right now." However decisively "we choose not to see," to use Ghosh's phrase, there are worlds behind our screens and beyond our pages. They can be brutal past even inspired telling. They can be beautiful beyond poetic rapture. If one does want to see, it takes conscious effort to keep sufficient distance from the illusion that screens and pages are the world itself. One needs to lift one's eyes and look. Apples to oranges, I'm partial to the imaginative travel experience delivered by novels over those available from TV, movies, and intertubes. Perhaps that's because prose fiction requires more of my own imagination, and so pulls me into deeper emotional and intellectual engagement. But then ... musing on the changing world ... I stack Mike Daisey beside Amitav Ghosh, and wrap them up in Jerry Mander, and then begin to wonder how the experience of reading books on devices that also open onto the internet will change the way people conceive the world's borders. Will e-books further extend our imaginations? Or will electronic mediation lull us into accepting a softer focus on the complexity and intractability of brick-and-mortar (or tide-and-tiger) otherness? I saw a wall-sized poster in a Starbucks recently. I love good coffee; I don't find myself in Starbucks very often. Maybe you haven't much alternative to chain espresso in your town, so you've seen this monstrosity often enough to stop noticing it. Five images: coffee beans drying on racks, bags of coffee beans, a basket of coffee beans, a scale on which coffee beans might be weighed, coffee beans bagged for sale and brewed for tasting. And this prose: "It's pure commitment to doing business in ways that are good to the earth and to each other. From the way we buy our coffee to minimizing our environmental footprint, to being involved in local communities. It's doing things the way we always have. 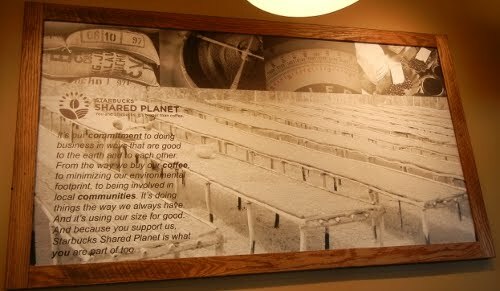 And because you support us, Starbucks Shared Planet is what you are part of too." Now that's writing for you. Smooth. Polished. 59 carefully crafted words that say exactly nothing. Over five images and a logo don't say anything either. I wonder how much the marketing department was billed for this masterpiece. Go on, re-read the text. What "ways"? What "things"? WTF? I don't want to diminish Starbucks Corporation's commitment to LEED-certification for all new stores, or any of the other impressive looking commitments to improve the company's net environmental impact. But. Context please? This poster was mounted at the far end of a store packed with dozens of different preparations of coffee beans (ground, whole, instant, multiple roasts, multiple sources), each packaged in metal foil and plastic; with coffee making presspots and grinders and espresso machines for use at home; with ceramic and steel "drinkware" (I got that word from starbucks.com, actually, isn't it awful? ); with paper cups and plastic lids and straws and wooden stir sticks; with plastic gift cards; with Pick of the Week free iTunes download cards ... and that's on the customer side of the counter. And we haven't even touched the tea. Then there was the heavy-duty barista equipment for brewed coffee and espresso and blended coffee slushies (yes, I know what Starbucks calls them, and no I'm not going to type it any sooner than I'm going to call a small cup of coffee "tall"). Not to mention the space-age Clover® brewing contraption that, the purveyor claims, makes better coffee because "a thermal blanket surrounds the brew chamber to keep water with in 1 degree Fahrenheit of the ideal temperature." Yes, of course a cup out of the Clover® costs extra. A few days after I saw this vacuum-packed greenwashing silliness I read an article in The New Yorker about fashion designer Tomas Maier. Now I'm not saying Mr. Maier is leading the Save the World pack, not by any means, but I did like the article's title: "Just Have Less." "A chain store can sell a pair of khakis for sixteen dollars," he said. "I can't even get a bolt of khaki for that much. That means they are being made in some country where a kid is chained sixteen hours a day to a sewing machine. At Bottega, we pay our artisans in Vicenza properly, with benefits, and excellent working conditions. We use the best materials, and we make things in a way that is built to last." He insisted that Bottega's goods were not beyond the reach of middle-class people, who have simply been trained to want too much stuff. Anyone, he said, could afford one five-hundred-and-fifty-dollar hand-painted cashmere scarf. "Just have less," he said. Just have less. Sounds like the right message to me, however unlikely the source. Starbucks could start by taking that ridiculous poster down off its walls. In A Tale of Two Moralities (13 Jan 2011, NY Times) Paul Krugman describes a fundamental divide among Americans about "what constitutes justice." In a couple of sound bytes, Krugman categorizes Americans into two groups: those who believe it's right "for the affluent to help the less fortunate," and those who believe "people have a right to keep what they earn." It's a compelling opinion by a thoughtful essayist, and worth reading. Needless to say, not everyone will agree with Krugman's ontology. Some of the 763 comments to his op-ed point out that people can help others without the government playing the role of broker or enforcer; or that the federal government can step back and let state governments do the brokering. And, yes, both of those are possible in some bravely imagined universe. But stretch that brave imagination a little further. Those who believe it's right for those who have more to support those who have less consider such support a moral imperative -- something we're all obligated to do, not something people can do if and when they feel like it. Those who believe they have a moral right to direct how much of their wealth gets shared with those who have less, and which of those who have less, and under what idiosyncratic conditions, do not believe that moral imperative applies. In diametric opposition, they insist on a moral right to disburse their wealth as they see fit, if they see fit. Krugman wrote, "In future columns I will no doubt spend a lot of time pointing out the hypocrisy and logical fallacies of the 'I earned it and I have the right to keep it' crowd. And I’ll also have a lot to say about how far we really are from being a society of equal opportunity, in which success depends solely on one’s own efforts." I'll look forward to that (and will circle back to the next of Krugman's NYT op-eds in a few paragraphs). For a moment, though, let's set aside moral rights and imperatives. Let's consider dollars and cents. Atul Gawande is a surgeon, a professor of health policy management at Harvard, a 2006 recipient of the MacArthur Award (a.k.a. the "genius grant"), and a staff writer for The New Yorker. His latest article in today's issue of that magazine is The Hot Spotters (24 Jan 2011). The article describes provision of extra care dispensed to a fraction of the very small percentage of people (1%) whose medical care costs a lion's share (30%) of what Camden, New Jersey spends delivering medical services . These super-consumers of health care resources turn out to be some of the poorest, least organized, most drug-addled people in Camden's population. They're often not the sort that your average taxpayer, worried about how much of an uncertain paycheck the government is going to appropriate, would naturally bump to the front of the Let's Help This Person line. Often they look like they can't be helped. Some aren't willing to be helped. In some healthier people's view, individual agency -- real or imagined -- in the degree to which a complex illness has devolved actually disqualifies a human being from 'eligibility' for social assistance. Go figure. And yet, through the efforts of a doctor named Jeffrey Brenner, engaging activist providers -- and social workers or "health coaches" to aggressively manage care and give follow-up support such as encouraging patients to take prescribed medicines, keep doctor appointments, cook nutritious meals, and so forth -- dramatically reduced the cost to the government of the net services used by those receiving the "resources and brainpower," as Gawande puts it, directed their way. The raw reduction in costs? In Camden, 56% in bills for hospitalization. True, the net savings will be lower after taking account of a complex basket of medical costs and what-if outcomes in addition to reduction in hospital bills. But Gawande characterizes the health savings in Camden as "revolutionary" (uh-oh, does that make him a Marxist too?). Other examples described in his article (some summarized below) suggest these savings are not a fluke. And if the government saves money, that means taxpayers do too. We are, after all, funding the operation. In fact, identifying patients whose medical expenses are bloated not because of their conditions per se, but because their conditions aren't well-managed is big business for a company outside Boston. The company is called Verisk, and it analyzes data about delivered care to help employers reduce their health benefit spending. According to Gawande's article, a medical doctor named Nathan Gunn, Verisk's head of research: "uses his company's medical intelligence software program to zero in on [...] patient[s] who are sick and getting in adequate care. 'That's really the sweet spot for preventative care, Gunn said.'" Systemically speaking: "The critical flaw in our health care system [...] is that it was never designed for the patients who incur the highest costs." Is there hope that our behemoth system can be redesigned? Maybe. A program you might have heard of -- Medicare, in which the federal government acts as a single-payer insurer for 80% of medical expenses for people over 65 years old -- is running programs to incent the kind of care management practiced by Dr. Brenner in Camden and encouraged by Dr. Gunn of Verisk. It's working at Massachussets General, to the tune of a 15% reduction in emergency room visits, and the program is just coming into its stride. A radically-redesigned practice in Atlantic City, New Jersey that adds social work and "health coaches" to the medical care mix reduced emergency room visits and hospitalizations by 40%. In a small preliminary study comparing this practice's patients with a group managed more traditionally, a 25% reduction in overall costs was realized. The common denominator here? Investment in additional care, targeting prevention and health maintenance to reduce need for emergency intervention. Note the first word of that last sentence: investment. Back to Krugman, who did not win a genius grant ... but was awarded the Nobel Prize in Economics in 2008. In his NY Times piece of 16 Jan 2011, The War on Logic, Krugman enumerates a slew of lies and misdirection that Speaker of the House John Boehner (R-Ohio) and his party are employing to build an illusion that their interest in rolling back health care reform enacted in March of last year has to do with deficit reduction. I won't repeat the facts he cites; read Krugman in his own words, The War on Logic is short and clearly focused. As Krugman summarizes his argument, "The key to understanding the G.O.P. analysis of health reform is that the party’s leaders are not, in fact, opposed to reform because they believe it will increase the deficit. [...] They’re against reform because it would cover the uninsured -- and that’s something they just don’t want to do." Maybe so. While that seems pretty illogical to me, the "reasons" Boehner and company advocate for scuttling health care reform are pretty illogical too. So maybe we've got a syllogism here? That's the power of ideological opposition to health care reform. Go back a few paragraphs. To the part of this post explaining how recent studies demonstrate that by providing health care, health management, and social support to the least fortunate among us, society as a whole can reduce health care costs. Is that an idea worth pursuing? I sure think so. Is that where President Obama's health care reform is headed? Well, actually, yes. What does the Party of No propose as an alternative to reducing costs? Are we to barricade public hospitals to people who don't have health insurance, like Camden's 1%? That would be cheaper even than the rational sorts of health care described by Gawande in The New Yorker and on NPR. If such people -- it's human beings we're talking about -- were left to die in the gutters, society could save a fortune in medical care costs. Maybe that's what Rep. Boehner has in mind when he spews tricksy lies about health care reform and deficit reduction? A sort of right-wing homecoming to Social Darwinism, where if you can't disprove evolution you employ it to wipe out poor people? Me, I'll take post-ideological health care any day of the week. Starting last week. 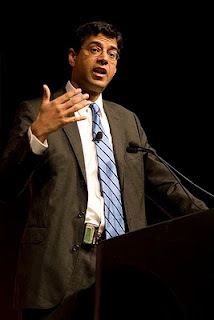 Thanks to AmericanLibraries for the image of Dr. Atul Gawande published on Flickr. 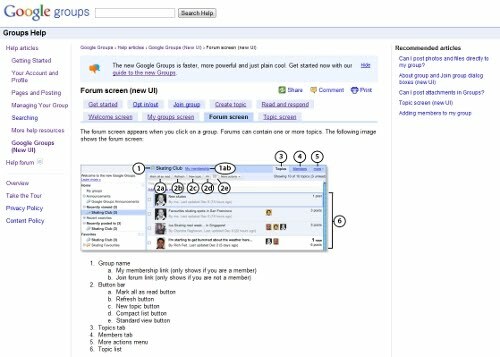 The old Google Groups is dead. Long live the new Google Groups? In November I wrote about upcoming changes to Google Groups that, it seemed to me, signaled Google's next moves in social-media space. Those changes have arrived, as of last week. Google Groups no longer permits upload of files or pages. One can view preexisting files and pages, and the last "welcome message" at the top of the old-style home page as it was published prior to the Jan 13th changeover date. But no new pages, files, or edits to the "welcome message" are permitted. This is precisely as the Googleplex forewarned. But the new discussion forum interface permits inclusion and update of a welcome message -- not a feature that I understood to be in the pipeline -- and files can be attached to any post in a forum discussion thread (this feature can be restricted to managers-only). Posting files in discussion threads is a double-edged sword. In many forums (including the one I am active in) most participants elect to receive updates to discussions via e-mail. For many, receiving large attachments is unwelcome ... smaller e-mails in which links are given to files that can be downloaded when and where needed don't eat up as much local disk space or webmail storage quota. It's possible to avoid this problem by engaging with a forum only through visits to its website, but for those who prefer e-mail notifications and don't like receiving attachments this feature may prove annoying. One of my chief complaints in November was that Google Sites didn't have a supported gadget to embed a Groups forum in one of its pages. Setting up a Google Site to host a Group's web pages -- and to serve as a location to which files may be uploaded -- is one reasonably clean way to replace functionality that is unavailable in Google Groups as of last week. I hoped to use that option for my Google Group, but without a supported gadget the option was pretty much a non-starter. The good news is that Google now provides a Sites integration gadget. As I mentioned in a comment on the original post, Jiten Bhardwaj was first in a thread I started in the Google Sites forum to point out the new, embeddable Groups widget rolled out for Google Sites. For info on how to use it, check out the new Groups UI help article on the topic. Also noted in a comment on my original post, the new UI for Google Groups includes elements that do seem designed to support the Groups offering's alignment with Google's social-media strategies, such as "lightweight comments." These are tweet-sized riffs that can be added to any regular post to a Discussion Forum; however this feature only works for groups that conduct all business in the Groups interface (e.g., that have e-mail delivery disabled). The new Groups UI is explained in a set of Help articles for those who want more info. My on-line writer's group has been using the new interface embedded in our Google Site for several weeks now, and I have no serious complaints. On the other hand, I do wish it were easier to extract a thread from the Google Groups forums. Data portability matters, even if all that means is an ability to easily download a post or a whole thread for preservation or re-use elsewhere. For example, I like to keep sometimes-long threads of my fellow writers' comments on a story or chapter for future reference without wading through our group's archives, or so I can consult it off-line. Copy paste will do in a pinch, but something cleaner would be a nice feature. It's worth remarking that in the Getting Started screen for the new UI, the Googleplex warns that "The new Google Groups user interface represents the first in a series of updates to Google Groups..."
Last week was big for cell phone news, you betcha. The San Francisco Chronicle ran a front page story about AT&T's atrocious signal coverage in the Bay Area, and how that's driving a huge and hopeful hunger for the soon-to-be-available iPhone over Verizon. Flip a few pages (I know, I know, who reads actual printed newspapers anymore?) and we find California's newly-reminted Gov. Jerry Brown issuing his first executive order. The governor ordered state agency and department heads to collect half of the approximately 96,000 state-issued cell phones used by public employees, a move he said will save California at least $20 million a year. Brown also plans to return his own state-issued cell phone, said Evan Westrup, a spokesman for the governor. Each cell phone costs an average of $36 a month, according to the governor's office. Thirty-six bucks a month? 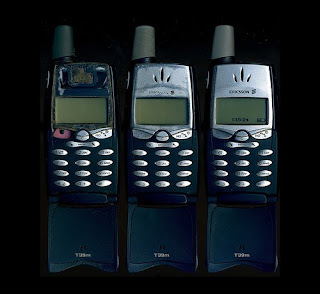 Those sure aren't iPhones ... and, indeed, Westrup indicated that "Sprint and Verizon are the state's primary wireless providers." Maybe that's the story behind the story, then? Brown is acting to stem the tide of state-employed Verizon subscribers expected to "lose" or "drop" their current cells and "need" an iPhone for a replacement? Most people I know have war stories about rats. When I think back, I have quite a few myself. Not just stories about plumped-up rodents seen scurrying alongside buildings in Washington, DC, or skinny rats scampering across the sidewalks of New York's Alphabet City, or rats nosing around the ruins in Rome or the metro tracks between BART trains in San Francisco. I'm not even talking about rats scampering along telephone wires outside the house, or through the ivy outside one's workplace, or eerily squeaking in packs across the back yard in spring, which I've gathered over the years is rat-baby season. I'm talking about rats inside the places one lives and works. Actual cohabitation, see? Oddly, this month seems to be generating a lot of rodent stories, at least in my circles. A friend posted to Facebook a photo of the hilarious warning sign her daughter taped to a bathroom door after seeing an elusive but long-present mouse run in. She shut the cat in as well, hoping ... for resolution, I suppose you'd say. Then a near neighbor, author Leslie Larson (Breaking out of Bedlam, Slipstream) blogged a fabulous thread of e-correspondence last week in which she and author Spring Warren trade rat stories. I began to draft this post just before taking a break for the holidays, and seeing Leslie's post kicked it to the head of the queue. My earliest rat stories are science stories. The very earliest is actually about a bat that my dad found clinging to the mailboxes in our apartment building's lobby when I was in second or third grade. Dad trapped it in a glass jar and punched holes in the lid. The bat was pretty out of it. Maybe it was rabid. Anyway, that's science, right, showing little kids what a bat is? The critter died a day or two later. But a bat isn't a rat at all, so it doesn't quite fit this post. The next earliest is about my brother and an etherized mouse, which is also not a rat, so we'll save that for another time. My first real war story about rats is not very flattering. Actually, none of my rat stories are very flattering, but this one involves my attenuated career as a neuroscience research dude & rat executioner. In short: there were rats, there were experiments, I was trained to "sacrifice" rats raised as experimental subjects, it wasn't pretty, and that was even before the part about slitting open rat abdomens and digging through warm rat guts to cut out the adrenal glands. Did you know that rats' adrenal glands are very very small? Even if the rats are pretty big, and these fellows were hefty. I don't think you really want to know much about the method we used to "sacrifice" the rats in question; I have little stomach for describing it graphically. Clinically speaking? Well, the papers published in Molecular Pharmacology say "Animals were killed by cervical dislocation." I was nineteen when I killed more than a few rats by cervical dislocation, and -- not counting the rat that drowned in a toilet trying to enter our house through the sewer pipes -- I didn't have much in the way of rat stories until I was in my thirties, living on 54th Street in Oakland, California. I suppose I was carrying a fair bit of rat-killer-karma from those dark days in the Stanford University Medical Center, so it shouldn't have been a surprise that I nearly dropped my teeth when a rat jumped out of a pile of backpacking equipment that I was sorting through in a dark, under-the-stairway closet. I screamed like a fifteen year old debutante; smacked my head on the closet's low ceiling; and ran upstairs in a fright, babbling about our rodent invasion to my bemused housemates. They weren't so bemused when one of them opened a kitchen drawer looking for candles or matches or some such thing a week or two later, and a rat jumped out. Not bemusing. At that point, it was war. We put snap-traps out, baiting them with cheese and peanut butter, and it didn't take long to snap that kitchen-drawer rat. I was hugely unhappy that it fell to me to retrieve the trap and very dead rodent from under the sink. I couldn't even look at the thing without whimpering. What to do? Abstraction was clearly going to be essential. Torque, I was thinking. An abstraction of weight. I found a long pair of slip-joint pliers in the garage, opened a paper grocery bag beside the sink and -- without looking at the dead thing except out of the furthest corner of my eye, I used the pliers to pick up the trap by its long tongue of a trigger. The idea was to have only an indirect sense of the meaty weight of the very very dead rat. Memories of those chunky rodents I "sacrificed" by cervical dislocation ... ugh ... those memories made a torment of even the brief seconds of rat-weight dangling from the end of my pliers. I dropped the contraption-plus-rat into the paper bag, then picked up the bag with the pliers and walked it at arms length to the trash cans outside. But that was nothing compared to the rat we found a couple months later rotting underneath the table out in said garage, a table that we used to fold laundry. Now that rat was dead. Hella dead. In fact, he must have been dead for weeks because he was bloated and leaking dead rat juice all over the dank concrete floor. I screamed and squealed over that one too, and flat out refused to deal with it. My housemate Susan, who wore the pants on 54th Street, picked the festering thing up with a shovel and dumped it in those same trash cans. Then there was the time I took out a cutting board, set it on a kitchen counter, and reached for a pear. I was about to make a pear tart, I think. Or a pear salad. In any case, someone had taken a very big bite out of the lovely, ripe Comice pear perched at the top of our fruit bowl. No. Not someone. Something. And not a very big bite. A very many little bites. Eeeeeek! Rats! Crawling around our kitchen and eating from our fruit bowl! I began lying awake nights, listening. I heard them all right. But by the time I worked up the nerve to turn on the light, the rodents were gone, out of sight. Until the night I saw them arrive. Sitting up in bed as soon as I heard them stir, shining a flashlight out the bedroom door, I spotted two of the disgusting buggers round the corner from the hallway into the kitchen. I'd latched onto a little corner of maturity by then, so I didn't squeal. Not very much, anyway. I did slam shut the bedroom door and stuff a towel into the space between it and the floor. Damned if I wanted those bubonic beasts scuttling under the bed. I didn't sleep much more that night, I can tell you that. The next day I bought glue traps. I was thinking, heck, the apartment we live in is way smaller than that sprawling house on 54th Street. There, if a trap set in the kitchen snapped in the middle of the night you might not even hear it. Here you'd practically be sleeping on top of the thing. There was no way I was going to go rock-a-bye if I feared at any moment that a rat was about to trip a trap that would sound off like a shotgun in the night's tranquility. A glue trap, I imagined, would be a quieter affair. Rat runs across trap, gets mired in glue, and quietly drowns. Peaceful. Like the La Brea tar pits. We woke to the sound of flexing plastic. I sat up in bed soon enough to see the trapped rat's best rat-friend scurrying back out of the kitchen and into the hallway. But there was no doubt that one of the little bastards had been caught. 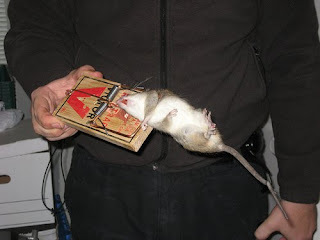 Unfortunately, I hadn't considered the ratio of rat to glue trap. Thrashing and flailing and literally tearing its fur out to extricate itself from a trap laid between the sink and the refrigerator, that stuck rat made a racket that would have woken a woolly mammoth. I got up. I put on my biggest, thickest, highest pair of boots. I tiptoed into the kitchen. The thrashing was constant. That rat wanted out. That rat wanted out badly. I waited. What was I going to do, club the thing? No effing way, man. Let nature take its course. The rat would eventually suffocate in the glue, according to optimistic scenarios outlined on the glue trap packaging. And then I'd have to rustle up that ding dang slip-joint pliers again. In point of fact, the rat won. Sort of. Won out over the glue trap, anyway. It thrashed and flailed and tore its fur out, and eventually ran the trap dry, sopped up all the glue, I guess, or enough to detach itself at any rate. Next thing I knew the thrashing stopped. Silence. I slowly, oh so slowly, peeked into the space between the sink and the refrigerator. Nothing. An empty glue trap. Dry. Glueless. Flecked with rat fur. And where was the rat? I shone my flashlight into the space between the sink and the refrigerator. Nada. I stood on a chair, and climbed onto the counter. I shone my flashlight downward. There, among the refrigerator coils, a pair of beady red Houdini eyes stared back at me. I felt sick. Sick. There was a freakin' rat in my freakin' kitchen, I knew right where it was, and there wasn't a damn thing I could do about it but go back into the bedroom, close the door, and pile up major fortifications against rat intrusion. Not, I suppose, that the critter wanted anything more to do with me that night! In the morning, the refrigerator coils were rat-free. That story ended reasonably well, anyway. We finally realized -- having seen rat #2 flee back into the hallway that (doh!) the critters were getting in through a foot-square hole into the core of the building that our landlord left open when he replaced our wall heater a couple months before. Silly landlord. We closed off the opening with heavy-duty wire screening and that was the end of the pear-nibbling rats. Which brings me to the rat story that inspired this looooooooooooong excursion down memory lane. The one that started in early December with something rotten-smelling in the little anteroom between our kitchen and the back porch. I figured -- I wanted to believe -- that something had died in the crawl-space beneath the building, and the stink of its carcass was wafting up through the drainpipes. Okay, I thought. Maybe it's a wee mouse that died behind all the crap we've piled up over the years in this little anteroom storage space. Another week or two and it'll be decomposed down to clean mouse bones, and we'll leave it be until we move. Right? The smell got stronger still. Until I caught sight of a tail. Not a mouse tail. A long, skinny rat tail. I didn't scream. I didn't squeal. I didn't even run away. I also didn't look at the splayed-on-its-belly corpse except out of the corner of my eye. Some things don't change. But the good news was that despite the stink, this rat was still intact. All inside its skin, unlike that putrescent mess in the garage on 54th Street. I climbed down the rickety wooden stairs into the yard. I found a very long handled, heavy shovel that belongs to my upstairs neighbor. A shovel so heavy that the weight of a rat wouldn't really change the feel of it. I climbed back up the stairs. I scooped up the rat. I still wasn't looking. I carried the shovel (and its undiscernable cargo) over to a paper grocery bag in which I'd already tossed a bunch of crap dug out of the storage space that really didn't need to be stored any longer. I dumped the dead rat and its long, skinny rat tail into the grocery bag. Then I carried the bag down to the trash bins in the side yard. I didn't even have to use a pliers. Do you have a rat story to share? Thanks, sort of, to Arthaey Angosii, a braver rat killer than I'll ever be, for the photo. And to carlosfloro (Carlos Floro de Melo) for the video upload, complete with Portugese subtitles, of the late Michael Jackson singing a love song to ... a rat! A congressperson is in critical condition after having a 9mm bullet shot through her head. A federal judge, a seventy-six year old pastor, and a nine year old child are among the six human beings executed by the attacker. Six people were killed; fourteen, including Representative Gabrielle Giffords, were wounded. Giffords remains in critical condition as these words are posted. It is far too early to judge who or what demons drove Jared Lee Loughner to commit murder and mayhem outside a grocery store in Tucson. But it would be callow to allow media and politicians to package Saturday’s tragedy in a "lone nut case" box and dismiss it. House Speaker John Boehner is correct to note that "This is a sad day for our country." But no one with a pulse can fail to see that Arizona has been a field of angry and threatening political rhetoric that has accompanied the rise of the so-called Tea Party. During last spring’s health care votes, the language used against some lawmakers was ratcheted up again, with protesters outside the House hurling insults and slurs. The offices of some Democrats, including Ms. Giffords’s in Tucson, were vandalized. Ms. Giffords was also among a group of Democratic House candidates featured on the Web site of Sarah Palin’s political action committee with cross hairs over their districts, a fact that disturbed Ms. Giffords at the time. "We’re on Sarah Palin’s targeted list," Ms. Giffords said last March. "But the thing is the way that she has it depicted has the cross hairs of a gun sight over our district. When people do that, they’ve got to realize there’s consequences to that." We’re paying particular attention to those House members who voted in favor of Obamacare and represent districts that Senator John McCain and I carried during the 2008 election [...] we’re going to hold them accountable for this disastrous Obamacare vote. A list of seventeen representatives and the congressional districts that elected them followed this excerpt. Representative Gabrielle Giffords was on Palin’s list. The "crosshairs map" appeared just below it. Note the prominent text at the top of the map: "It’s time to take a stand." A stirring call to political engagement? Or part and parcel of the "imagery of armed revolution" employed by the Republican Party last year, "as they sought to exploit the Tea Party phenomenon," as Matt Bai pointed out in the NY Times on Sunday? I don’t see anything explicitly illegal in Palin’s message. She is protected by the same right to freedom of speech that protects me in writing this blog post. But "not illegal" in this case cozies right up to 'inflammatory as all get out.' And 'inflammatory' is what Palin’s Tea Party politics have been from the start. Failure to take responsibility for even considering what part Palin’s posturing may have played in Saturday’s executions, an aide to the failed VP candidate, Rebecca Mansour, went on record with the statement, "I don’t understand how anybody can be held responsible for somebody who is completely mentally unstable like this." Mansour wasn’t talking about her boss. She was talking about Jared Loughner, the shooter in Tucson. 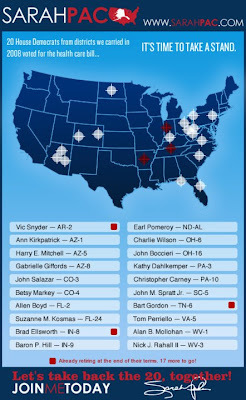 Mansour, according to a NY Times report, claimed that the crosshairs in Palin’s map were not meant to reference guns. The "mecca for prejudice and bigotry." Osama bin Laden did not pilot the airplanes that slaughtered thousands on 11 Sept 2001. Sarah Palin did not wield the weapon that put a bullet through the skull of a U.S. Representative, the Glock used to murder a nine year old girl, a federal judge, a pastor, and three others. But Ms. Palin’s office must think Americans are phenomenally stupid if they expect us to swallow public pretense that their vitriol has no effect. "The most obvious points of comparison would be these: Both movements are based on a cult of murderous violence that exalts death and destruction and despises the life of the mind. ("Death to the intellect! Long live death!" as Gen. Francisco Franco's sidekick Gonzalo Queipo de Llano so pithily phrased it.) Both are hostile to modernity (except when it comes to the pursuit of weapons), and both are bitterly nostalgic for past empires and lost glories. Both are obsessed with real and imagined "humiliations" and thirsty for revenge." I challenge the toxin-tongued hysterics who recklessly sling this term and similarly venemous polemic rather than engage in meaningful political discourse. I challenge them to step back from the precipice of Tea Party Infusofascism. Will they do so? Or will they continue to foment a second civil war, a conflict that would bring unbearable calamity to the United States and the world? My partner reads in three languages: Chinese, English, and German. He puts this monolingual reader to shame. His views on translation are worth watching, and it was on his advice that I chose the Richard Pevear and Larissa Volokhonsky translation (2007) of Tolstoy's War and Peace when we visited City Lights Books in San Francisco's North Beach last week. "A translator who turns a great original into a patchwork of ready-made 'contemporary' phrases, with no regard for its particular tone, rhythm, or character, and claims that that is 'how Tolstoy would have written today in English,' betrays both English and Tolstoy. Translation is not the transfer of a detachable 'meaning' from one language to another, for the simple reason that in literature there is no meaning detachable from the words that express it. Translation is a dialogue between two languages. It occurs in a space between two languages, and most often between two historical moments. Much of the real value of translation as an art comes from that unique situation." That perspective convinces me to entrust the hours it will take to read 1213 pages of Tolstoy's fiction to Pevear's & Volokhonsky's linguistic judgment. I'm trying to translate the French bits for myself as I go along, but really it's hopeless. There's almost always a key word I fail to recognize; I depend largely on the translators' footnotes. Earlier the same day I bought War and Peace, we'd been to the De Young Museum for the second of two wonderful exhibitions of art on loan from Paris, Van Gogh, Gauguin, Cézanne and Beyond: Post-Impressionist Masterpieces from the Musée d’Orsay. I have long been enamoured of Van Gogh's visionary paintings, so I'd have to say the room dominated by The Starry Night (1888), Bedroom at Arles (1889), and other Van Gogh works was my favorite. If you're in the Bay Area, the exhibit closes on 18 January, so there's still time to see it. The show is made up principally of work by painters whose native language was French. I therefore found the lack of original, original-language titles on labels provided by the curators disappointing. This lack was brought into sharp -- but misleading -- focus by one of the labels that did include titles in French and English. The painting is one drawn from the collection of the Fine Arts Museums of San Francisco, rather than d'Orsay, and was painted by an American who spent much of his life abroad, John Singer Sargent. 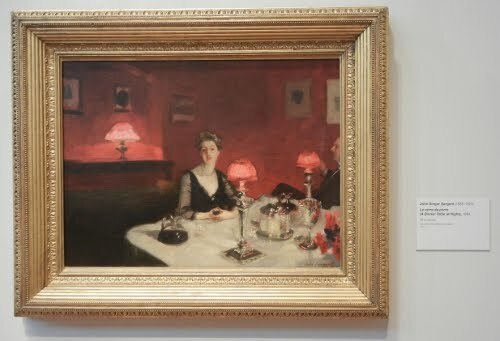 The painting's title is given as "Le verre de porto" in French; and "A Dinner Table at Night" in English. The one is not a literal translation of the other, which was easy to recognize. Why then, I thought, did the label layout (see photo) imply that it is?. "Le verre de porto" is literally translated to English as "The glass of port." We don't happen to have any books on John Singer Sargent at home, but a master's thesis written by Jennifer Lynn Friedman (1999, San Jose State University) treats the English label as authoritative, and indicates several alternate titles, including "Glass of Claret" or "Verre de Porto." Friedman cites as a source for the French title "an article from the Gazette des Beaux-Arts reviewing the show" in 1885, at the Galerie Georges Petit, in which the painting was first exhibited (cf. footnote #14 in Friedman's thesis if you're fact-checking this post.....). 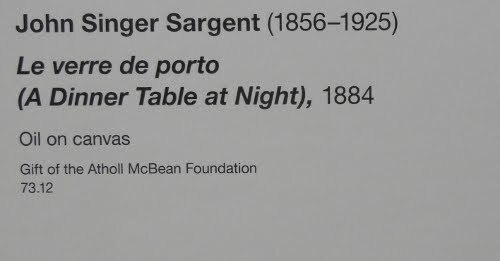 I am curious whether the artist, his gallerist, the reviewer, or someone else altogether supplied a French title for Sargent's painting. Whatever the source of the alternate titles, the initial impression I had of "mistranslation" turned out to be a case of a painting named differently during the period of the work's earliest exhibition. "As a painter, it is always gratifying for me to see a painting or a drawing as pivotal element in literature or stage work[s]. It is even more fascinating when the focal point of the work is the creating of a piece of visual art. A good example is the novel by Tracy C[he]valier and [the] movie The Girl with a Pearl Earring, which gave a very detailed and fascinating account of a period of great painter Johannes Vermeer's life [...] and his creation of the painting The Young Girl with Turban. The novel and the movie was so overwhelmingly popular that even the collector of this painting, [the] Mauritshuis Museum in [Den] Haag, was presumably forced to change its title to The Girl with a Pearl Earring." I do wish I could read in more than one language. Lacking that ability, I am deeply indebted to those like Richard Pevear and Larissa Volokhonsky who share their multilingual, cross-cultural riches with lesser mortals. Thirty-six executives of the University of California "believe it is the University's legal, moral and ethical obligation" to implement changes to the system's pension plan that would allow them to retire with pensions calculated on their actual, exceptionally high pay levels rather than the (lower) federal limit for such pension calculations -- the federal limit is $245,000/year. This change, if it goes forward, would give some of these executives a post-retirement raise of more than sixty percent -- from a pension worth $183,750 annually to pension pay at $300,000 per year for an exec whose working salary is $400,000. The Whinging 36 are threatening legal action if they don't get their pensions plumped. These executives claim in their letter and attached position paper (from which the foregoing quote was drawn) that the changes they demand were promised by the University's governing Board of Regents and other executives. This is actually pretty important, and I'm inclined to believe them on that point. I'm not qualified to debate signatory and Whinging 36 leader Christopher J. Edley, the dean of UC Berkeley's law school, on questions to do with the legal obligations in play. I do note, however, that it was apparently legal for the princes of Wall St. to slurp down bonuses that make UC executive compensation look like couch-cushion change, even after financial firms accepted billions of taxpayer dollars in bailouts for the mess they made of the economy. Never mind that the "recovery" that this bailout effected has yet to return millions of people to work at real-world wages. Well, if you're reading this you probably know the story, or one just like it from an economic sector near you. There has been plenty of outrage at Dean Edley & company's letter voiced by the San Francisco Chronicle's editorial board, by that paper's four letter-to-editor writers who sounded off on 30 Dec and eight more who weighed in on 1 Jan. I can't wait to hear what my colleagues say when I return to work today, the first our campus has been open for business since news of the execs' threatening letter to the Regents broke. But with the mud still flying, here's what this UC Berkeley employee does feel qualified to say to Edley and his gang of grasping execs: the assertion that a public university, in major fiscal crisis, has a moral obligation to spend scarce resources on exceptionally high executive pensions is a gross misapplication of the concept of morality. The University of California has a public mission. We operate on a (shrinking) public budget. We struggle to serve a constituency drawn from all walks of society -- not only a privileged, overcompensated elite. When a public university's leadership throws tantrums about wanting to be paid like administrators at Harvard and Princeton and Goldman-Sachs, they stain the work and reputation of faculty and staff who have been working for years and decades at below-market wages. So if, by "moral [...] obligation" the Whinging 36 mean a morality based on principles like "What's mine is mine, and what's yours is your problem but I might take that too" -- well ... that sounds a lot like class war to me, so at least I know how to understand what they're after. But if morality refers to a notion of right conduct that is grounded in common good and social obligation ... well ... sorry, highly-paid UC execs, you're way off base. Let's look at some numbers. 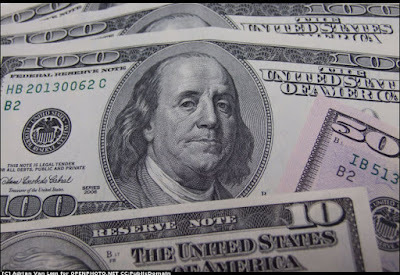 The U.S. Census Bureau pegged median earnings for an individual (2009 stats) at $35,285. At the University of California, where the demographics skew high due to an above-average workforce share of highly-educated faculty, medical doctors, and professionals, average compensation was $68,089 in October 2009. So, for an exec earning $400,000, what the Whinging 36 are whinging about is a pension worth over five times the median working income in the United States, or over 2.5x the average income of working University of California colleagues. What do they demand instead? A pension worth 8.5x median U.S. income, or 4.4x average income of UC colleagues for the example given. As a post-retirement benefit, mind you. This is after taking home pay, in this example, at a rate more than eleven times higher than the U.S. median, for years and years. I don't know about you, but that leaves a bad taste in my mouth. A vast majority of workers in the United States won't get pensions. Instead, people are expected to manage saving and investment for retirement themselves to augment our national retirement pension program, a.k.a. Social Security. Is that good? Is that bad? There are arguments to be made every-which-way, and they have been and continue to be made at length. I'm not going to make an argument in this post, it's long enough as written. But I will note that Dean Edley and company are walking a cleverly thin line, standing on ground they can claim to share with, as the NY Times put it yesterday, "[u]nion chiefs, who sometimes persuaded members to take pension sweeteners in lieu of raises" over the course of recent years and decades. The Whinging 36 are claiming that at least some of them were dissuaded from taking other (higher paying) jobs elsewhere by the promise and expectation that pension rules were going to be changed to inflate their retirement income. That's a powerful argument if claims are true that their employers made promises that materially affected their employment, and are now breaking those promises. At the same time, it's remarkable that university elites not only demand the stars as their due for lopping away jobs and benefits of the employees they manage; but simultaneously argue like union negotiators against the raging "class war on public workers," as friend and fellow-blogger katinsf put it in October. It's a weird, weird world. However you crunch the numbers, the Whinging 36 are demanding a very sweet deal ... one to which, in my moral universe, they really have no moral right at all ... however the legalities are sorted out. If you want to do some digging into details about the Whinging 36, the SF Chronicle's posted copy of their letter to the UC Regents gives each signer's name, title, and campus. Then you might hop over to the Sacramento Bee's State Worker Salary Search, which permits anyone to look up the salaries of public employees. For example, you can learn that Dean Edley was paid a fraction of that mythical $400,000 salary in 2009 (the fraction, roughly 27/32, works out more accurately to 84.13%). Here's how J.J. Lamb, of Novato, summed it all up in the lead letter to the SF Chronicle on New Year's Day: "Of course, greed is greed. The UC justification for outlandish staff compensation has always been 'We must compete with the private sector.' I say, release every one of these people to the private sector. Immediately." That's one way of looking at it. And in the heat of reaction to Dean Edley and his buddies claiming pensions that could dwarf the lifetime earnings of most Americans, it might feel like the right way to think of the Whinging 36: if these guys want to make rapacious salaries as big shot executives, the private sector is where that's rampant. But a more considered analysis -- in which that morality thing, you know, about common good and social obligation, carries some weight -- might lead one to conclude that certain degrees of differential in compensation ain't right no matter where it happens. There's enough; there's reward & incentive for extraordinary skill or initiative; and there's too bloody much. The Whinging 36's efforts to tilt high-end compensation further toward too bloody much doesn't look attractive to me as a blueprint for the future, whether that future is in the public or private sectors. Thanks to Adrian van Leen for the photo.